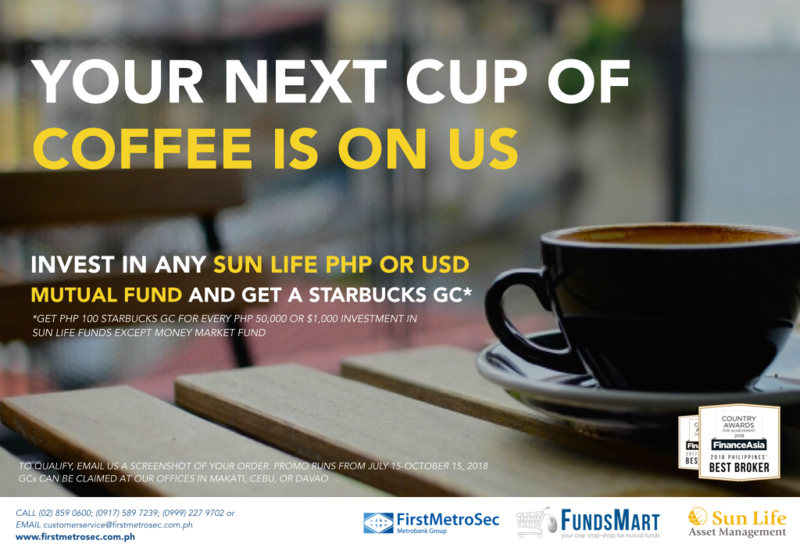 From July 15 to October 15, 2018, get Php 100 worth of Starbucks GC when you invest in any SUN LIFE PHP or USD FUND* available through FundsMart for every Php 50,000 or $1,000! To qualify, please email proof of investment to customerservice@firstmetrosec.com.ph. Rewards may be claimed at any FirstMetroSec Investors Center (Makati, Cebu, Davao). Redemption period of prizes will be until November 30, 2018 or until supplies last. Respective holding periods apply per fund.